Menlo Park Historical Association member Jim Lewis emailed: “The guillotine is falling. 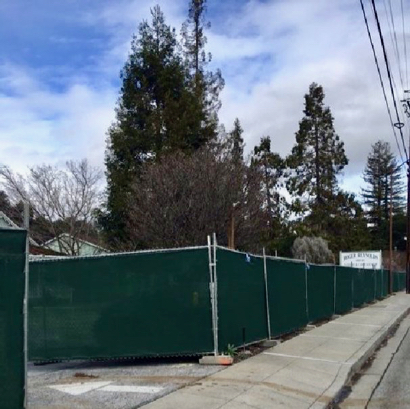 It’s the end of the road for the endeared local historical property formerly known as the Roger Reynolds Nursery, along with its iconic Carriage House [shown with adjacent dumpster]. Owner Sally Halstead closed the nursery in September, 2013. Make room for more condos and apts,yeh Menlo…take the train to the end of the line,but what about ECR,Nealon Park to the Oasis,could be 15 minutes,unless you know the back streets with speed bumps.All for speed bumps on ECR slow down the comuters rushing to their early morning workplaces! RUSH,RUSH RUSH…….to? Seems to be typical for the City of MP to continue down its wreaking ball path……very said what they are doing to the City!